Looking for an alternative to giving chocolate on Easter? How about this little Easter-themed terrarium? 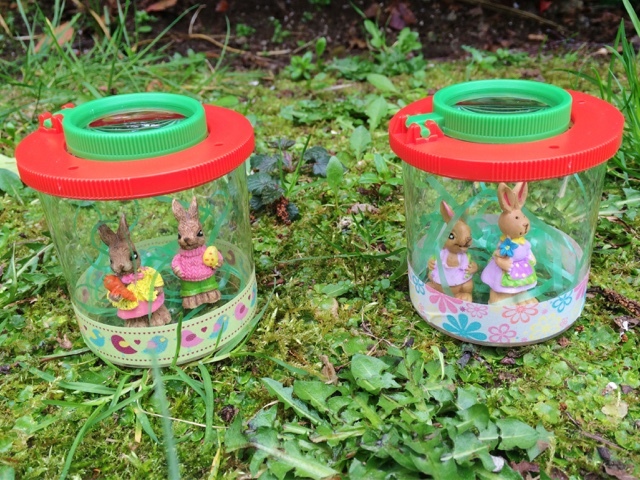 The container is a little plastic insect jar, with a built in magnifying glass for close up bug investigating! It's a perfect gift addition to your Easter egg hunts and baskets, or give them on their own to your neighbor friends. The best part about this gift? The total cost is less than €3!!! That's cheaper than what you'd pay for most chocolate eggs and this gift will last much longer than any sweet ever would. Read on to find out the super easy details to make your own Easter Terrariums. Step 1: Stick a glue dot to base of bunny figures and stick to bottom of the bug jar. Step 2: Add a bit of the fake grass and tighten lid. 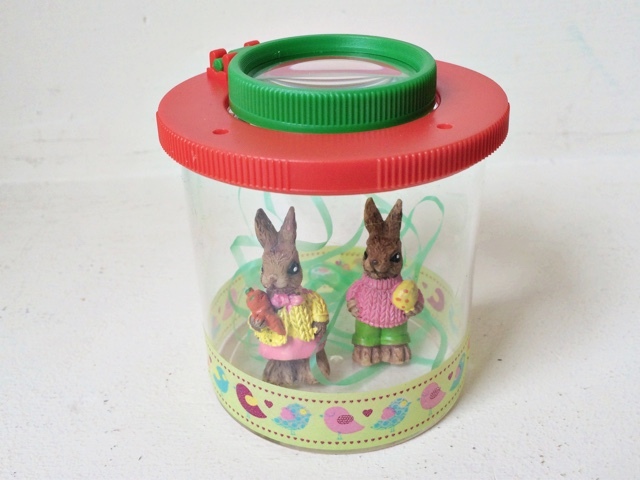 Step 3: Apply decorative tape to outside of bug jar. Step 3: Delight a child with your creative Easter gift! 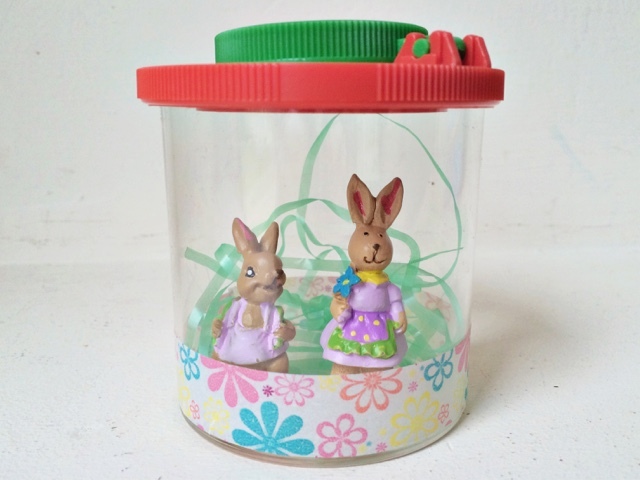 My children loved helping put these gifts together, especially playing with the whimsical bunnies. 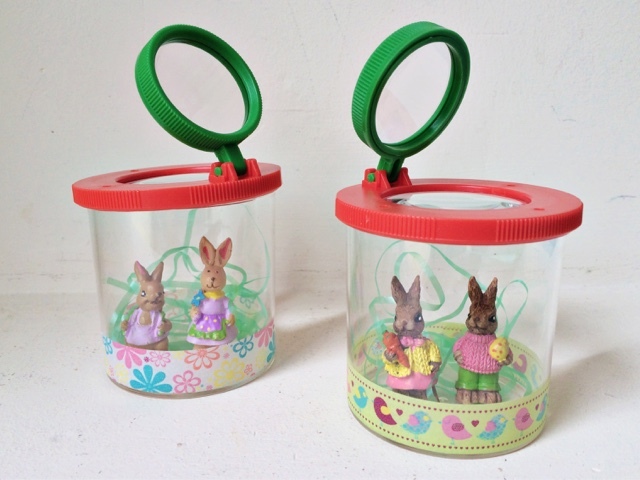 We've made a few of these jars up to give to friends this Easter and I can't wait to see the children's reactions! Or you could add these to your Easter Egg hunt mix- how cute would they be hidden along with some eggs? What do you like to give on Easter? Chocolate treats are always a hit, but do you have any non-candy options? Please share your ideas in the comments section below! Those came out really cute. always hard trying to find something other than candy to give. 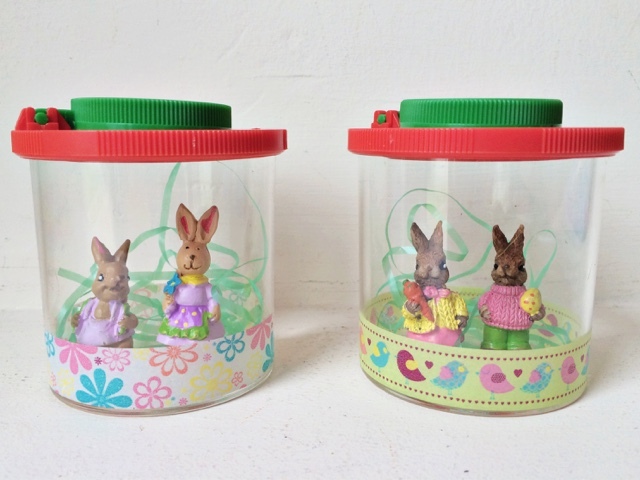 But I think the Easter bunny did a great job on these.